VANCOUVER, BC--(Marketwired - December 07, 2016) - Intrinsyc Technologies Corporation (TSX: ITC) (OTC: ISYRF) ("Intrinsyc" or the "Company"), a leading provider of solutions for the development and production of embedded and Internet of Things ("IoT") products, today announced the Company signed an agreement with a new client valued at US$447,000. The agreement is for the Company's product development services, including mechanical and electrical design and software development. The client's system will be based on Intrinsyc's Open-Q™ 410 System on Module and is expected to launch in the second half of 2017. "We are pleased to receive this development agreement and design win for Intrinsyc's Open-Q™ 410 System on Module to be leveraged in a compelling new automotive segment," stated Mark Waldenberg, Vice President, Global Sales, Intrinsyc Technologies Corporation. 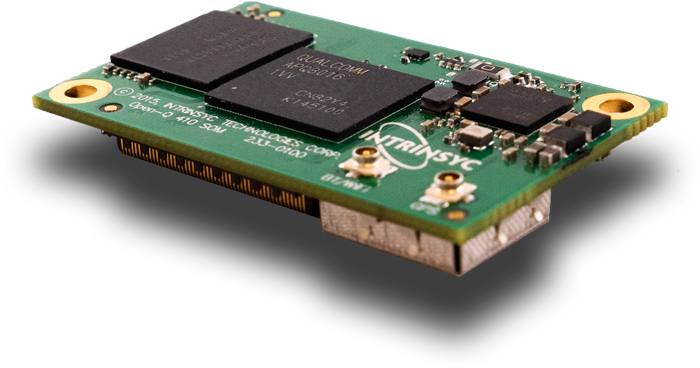 "The Open-Q™ 410 System on Module is a cost-effective, powerful computing platform, which Intrinsyc uniquely combines with complete product development services to enable our clients to reduce risks and accelerate innovative IoT products to market." Intrinsyc Technologies is a product development company that provides comprehensive and tailored solutions that enable the development and production of next-generation Internet of Things ("IoT") products. Solutions span the development life cycle from concept to production and help device makers and technology suppliers create compelling differentiated products with faster time-to-market. Intrinsyc is publicly traded (TSX: ITC) (OTC: ISYRF) and is headquartered in Vancouver, BC, Canada.